In developing recipes for Sodexo, Director of Culinary Services Chuck Hatfield wanted to keep a variety of craveable comfort foods in the mix. But under the company’s Mindful Enjoy Health wellness program, recipes must have less than 550 calories per serving, with 35 percent or less calories from fat. That’s a challenge with classics that rely on rich dairy products or bacon, such as loaded stuffed baked potatoes. To create a healthier but gratifying version, Hatfield took a few cues from Indian cuisine. “Indian samosas have a flavorful potato filling enclosed in a crisp dough. 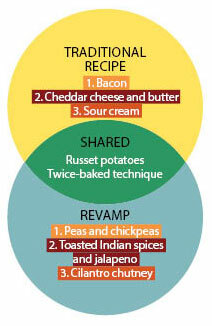 I reverse-engineered the samosa, piling the filling into the potato skin,” says Hatfield. For a vegetarian entree portion, he bakes an 80-count-size potato until soft and scoops out the flesh, breaking it into chunks for a rustic look. 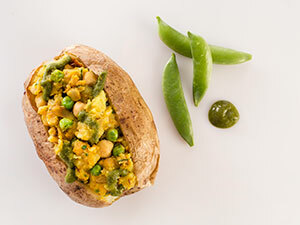 The potato chunks are lightly sauteed with onions and garlic, and peas and chickpeas are added for a boost of protein without the fat of bacon. Hatfield replaced the large quantity of butter and cheese typically found in this recipe with toasted Indian spices, including ginger, cumin, turmeric and coriander; jalapeno slices add a pop of heat. The spice blend also eliminates the need for additional salt, reducing the recipe’s sodium. Instead of the traditional sour-cream topping, Hatfield developed an Indian chutney made with fresh cilantro, mint, jalapeno and a little sugar. He purees the mixture to give it an almost creamy consistency. “The condiment replaces the sour cream with a similar saucy mouthfeel,” he says. Total calories per serving: 320.